Our “off the beaten path” journey will take us for the next two days to the northern Negev, first with a visit to Kibbutz Yad Mordechai and then to other nearby sites commemorating heroic battles during Israel’s War of Independence. We’ll then learn about the Bedouins, nomads who had previously roamed the desert but who now more permanently reside in parts of the Negev, with a visit to the Museum of Bedouin Culture at the Joe Alon Center. From there you can return to home base in Jerusalem or Tel-Aviv or continue to Beersheva for an overnight stay. The next day we’ll explore a Bedouin weaving center in the town of Lakiya, historic Tel Beersheva and the nearby Nabatean/Byzantine archaeological site of Mamshit. The latter are part of Israel’s national park system, and have also been designated as World Heritage Sites by UNESCO. Our drive on Route 4 from Tel-Aviv will take us about 10 kilometers south of Ashkelon to the entrance of Kibbutz Yad Mordechai, near the Eretz crossing with Gaza. The drive should take about 60 minutes, and if you have never visited the south, you may want to first read my Ashkelon blog. 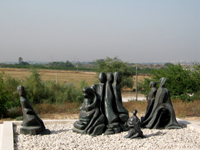 There is much to see at the Kibbutz and you should dedicate at least three hours to the Holocaust Museum, the reconstructed battle site, and the Bee and Honey Museum. The museum which was opened in 1968, is housed in a dramatic award-winning structure whose several levels are devoted to the theme ” From Holocaust to Revival”. Its entrance introduces you to the shtetel and the Jewish way of life in the first decades of the 20th century. Not unlike other Holocaust museums, this one traces the rise of Naziism , the establishment of the extermination camps, heroic efforts of the partisans and the Warsaw Ghetto uprising. However, the spacious interior is efficiently used by the large photographs, posters, religious artifacts and maps, and by the excellent recreation of the darkened narrow ghetto streets, the faithful reproduction of the bunker at Mila 18, the interiors of homes and a large scale model of the city of Warsaw. 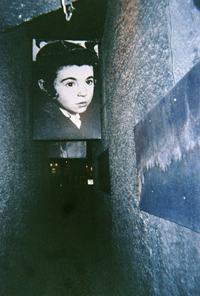 Most haunting are the photographs of murdered children whose faces stare back at you as you make your way through the exhibit. And recently, the museum added multi-media presentations in many areas which include well documented oral histories of survivors of the Warsaw Ghetto. The message of revival begins near the end of the top floor exhibits. There, photographs depict the illegal immigration into Eretz Yisrael and the establishment of the eleven defensive settlements on Yom Kippur night 1946. The expeditious establishment of these outposts on land purchased by the KKL/ JNF was meant to create facts on the ground in anticipation of the United Nations resolution dealing with the partition of Palestine. This action, which was sanctioned by the leadership of the Jewish Agency, was given the Talmudic name “the 11 points in the Negev” and is commemorated by old black and white photographs of pioneers erecting wooden structures and barbed wire fences while singing and dancing at the end of the day. 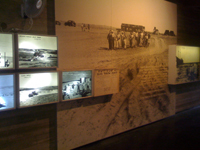 Another exhibit explains the hazards that were awaiting these settlers in laying the water pipelines that linked these 11 outposts and the subsequent siege that these kibbutzim withstood during the War of Independence. A most impressive display awaits the visitor on the ground floor of the museum. There, large photographs, sculptures, maps, weaponry, scale models of the battles, Arab newspaper articles and an Egyptian army film movingly depict the battle for Yad Mordechai. This exhibit serves as an excellent introduction to your visit of the actual battle field, a short drive from the museum. Before departing, ask the usher at the front desk to ensure that the gate to the site is open for you. There you can listen to an English language description of the six-day battle, while observing from a platform the placement of the tanks and metal cut-outs of Egyptian soldiers maneuvering toward the Kibbutz. The battle for the survival of Yad Mordechai placed its defenders at great odds against the Egyptian onslaught. While the Egyptians attacked on May 19, 1948 with planes, tanks and mortars, the 130 kibbutzniks fought back with only 55 primitive light weapons. Kibbutz Yad Mordechai was especially vulnerable as compared to the other nearby kibbutzim in that it is situated on the main north-south road, which permitted the Egyptian forces, in their drive to reach Tel-Aviv, to easily advance and encircle the defenders. Yet against these staggering odds, the defenders of the kibbutz were able to hold the Egyptians at bay for six days, permitting the nascent Israeli Defense Forces to establish a line of defense which stymied the Egyptian advance to the north. Still the loss of 24 of its kibbutz members finally persuaded the survivors of Yad Mordechai to retreat to neighboring, more secure kibbutzim. Kibbutz Yad Mordechai was abandoned, occupied by the Egyptians, and subsequently liberated by the IDF on November 5, 1948. The returning members found their kibbutz in ruins, but quickly set out to rebuild it. Today, Yad Mordechai is a thriving kibbutz, whose agriculture and dairy business are firmly anchored by the Holocaust Museum and an apiary. The apiary, which was founded 70 years ago, is today a unit of the Strauss foods conglomerate. It supplies 50 percent of all honey consumed in Israel and is also known for its olive oil and related gift products. While the production facility is closed to the public, the kibbutz maintains a honey-bee museum and gift shop. The museum is especially geared to accomadate children with hands-on exhibits, a short movie and pictorials describing the honey making process. Adults and children alike will find the beekeeper’s explanation of honey collection from live hives especially interesting. By reservation, the museum will be pleased to present the beekeeper’s lecture and movie in English. Though the kibbutz sites are generally open from 10-4 and Fridays from 10-2, it would be advisable to confirm these times (052-3923107 or 08-672 0559). It’s no doubt lunch time, and we’ll now make our way to the Nitzanim beach, about a fifteen minute drive to the north. There you can enjoy a leisurely walk on this pristine beach in the direction of Ashkelon or Ashdod, or enjoy a light fare at the sea-side restaurant. After lunch we’ll continue our Israel tour and make two stops nearby to gain a further understanding of the valiant efforts of the nascent Jewish community to defend this part of the Negev during Israel’s War of Independence. As you depart Kibbutz Yad Mordechai, turn left on Route 4 and proceed north, beyond route 35, to the Eshkolot junction. Turn left and follow an asphalt road past a military base to the dunes in the foreground. You can drive through the reserve and along the sandy beach before parking your car at the restaurant. After your break, retrace your way toward Route 4, but after the military base turn left at the brown sign with the flame leading you to “Old Nitzanim”. This should not be confused with the signage that will lead you to the residential community of Nitzan or the “new” Nitzanim Kibbutz on the other side of Route 4 that was established after 1948. The original settlement of Nitzanim was established by the JNF/KKL in 1943 to facilitate the landing of “illegal” Jewish refugees at the nearby beach in response to the British blockade that was based on the White Paper of 1939 limiting the number of Jewish immigrants to Palestine. Along with an adjoining orchard and vineyard, the JNF/KKL purchased an old Arab estate, known as the Mansion. Today this renovated structure serves as an office and field school for the Society for the Protection of Nature. Upon request, they will be also happy to screen a short movie about the founding of the settlement and the Arab attack on Nitzanim. Shortly after the Egyptian invasion of the Negev, most women and children were evacuated from Nitzanim. However, 10 women refused to leave the settlement, and instead decided to make a valiant stand against advancing Egyptian forces. However, the 74 men of the Givati brigade and the 56 members of the settlement were no match for the 700 strong Egyptian army that had easily penetrated the sandy defenses of Nitzanim. As casualties mounted and ammunition was soon depleted, survivors took shelter in the Mansion. Seeing no alternative, the Givati commander exited the Mansion with a makeshift white flag of surrender, but was immediatley shot and killed by an Egyptian officer. Miri Ben-Ari, the mother of a small son and operator of the Nitzanim radio, without hesitation drew her own weapon and shot the Egyptian. She in turn was killed by another officer.Today, this spot is identified by a group of eucalyptus trees towering over a stone memorial marker. Today, Miri Ben-Ari, the other two female defenders of Nitzanim who had been killed, and the many Israeli female soldiers who had fallen in battle during Israel’s wars, are honored at the Women of Valor Center that has been established at “Old Nitzanim”. An impressive sculpture depicting these heroines has been erected in front of the Mansion. You may wish to take a few moments to contemplate its moving message and also read some of the quotations on the surrounding plaques, before heading to the cemetery to view the beautifully sculpted rod iron fence marking important events in the history of this settlement. As we make our way to the Joe Alon Center and its Museum for Bedouin Culture, we will stop briefly at the battle memorial known as Givah (Hill) 69 and several other nearby sites. As you depart “Old Nitzanim”, turn right unto Route 4, and then immediately left at the light onto Route 232. At the brown directional sign, follow the road for about 1 kilometer toward a dirt road leading you into an evergreen grove. In front of you three pock-marked brick water towers from the time of the British Mandate dominate the memorial site. The hill was devoid of trees in May 1948, and served as an excellent strategic vantage point for its Israeli defenders. The Egyptians also well understood that whoever held the promontory could control movement on the important road below. For this reason, on the morning of June 10, 1948, the Egyptians launched a massive attack, lobbing more than 1000 artillery shells at the hill. The small group of Givati Brigade soldiers was almost defenseless against the assault of armored tanks and artillery, and lost 20 of its fighters before surrendering that afternoon. 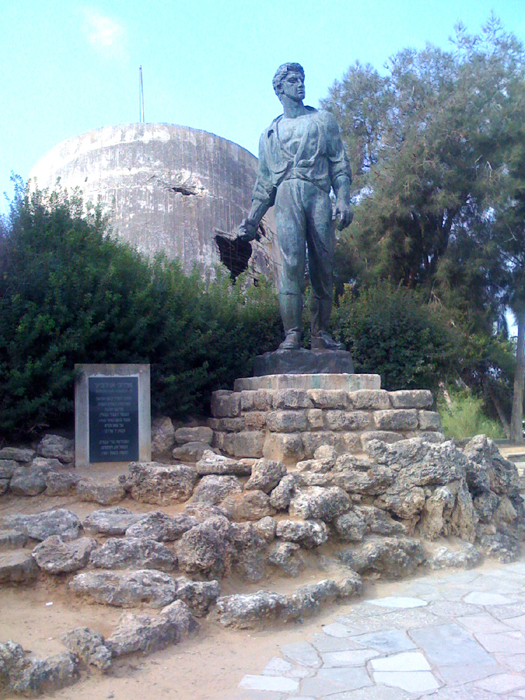 Hill 69 remained in Egyptian hands until the end of the War of Independence. Though the surrender was initially viewed with some consternation, today this moving memorial gives due recognition to the brave soldiers who defended Givah 69. Return to Route 232 and travel south a short distance to Route 35. Turn left and proceed several kilometers until you see the Yoav Fortress on the left side of the road. If this former British Mandate era police station (known as the Iraq Suidan fortress) looks familiar to you, the structure is quite identical to the Latrun police station located on the Jerusalem Tel-Aviv highway, and other similar fortresses built by the British in Palestine. The police station was captured by the Egyptians and after seven attempts, liberated by the Givati Brigade. 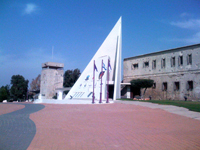 Today, the mortar riddled fortress serves as a museum to this fighting unit featuring an outdoor collection of tanks, half trucks, mortars and other weaponry, a memorial hall and excellent explanations of the history and desert battle field exploits of the Givati soldiers. The museum is manned by active soldiers of the Givati Brigade, who will provide you with a personalized tour of the museum in English and other languages. The black and white movie features excellent archival footage, and emotional interviews with former brigade members and is unfortunately often overlooked by those planning their travel to Israel. 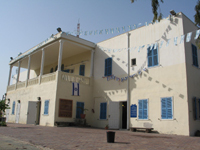 The former police station is today named the Yoav Fortress, commemorating Operation Yoav, during which the Givati Brigade played a crucial role in opening and securing the vital road to the Negev. IDF forces were fighting not only against Egyptian forces but also the clock, as the United Nations was poised to enforce a cease fire which would have left the Negev in Egyptian hands. At the direction of Yigal Allon, the Givati Brigade was able to break through the Huleiqat defense system, and after heavy fighting, open the corridor to the Negev. The Egyptians sustained heavy losses and subsequently retreated to the Gaza Strip. After completing your Israel tour of the Yoav Fortress, exit to the right and drive about 3 kilometers to the entrance of Kibbutz Negba. The kibbutz was founded as a defensive outpost in response to the Arab riots of 1936-1939, but by virtue of its location was one of the first kibbutzim to be attacked by Egyptian planes and tanks in 1948. Its defenders fought valiantly from their bunkers and trenches with only light arms and were able to repulse several Egyptian advances. Forty three fatalities were sustained, and the names of these Givati soldiers and members of the the kibbutz are now permanently enshrined on a plaque in the memorial area. Park outside the metal entry gate and proceed the short distance by foot into the park. There, behind the plaque, is a most impressive sculpture created in 1953 by the renowned sculptor Nathan Rappaport. Three large figures have been cast: a kibbutz member, a young fighter and a girl holding a first aid kit. A marker nearby states their purpose most eloquently: “The images represent two generations of defenders of our land. 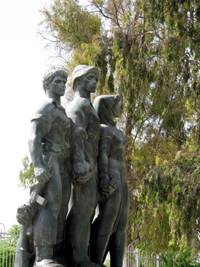 Their hands are interlocked symbolizing their unity, the kibbutz and brotherhood, while they are looking towards a future of growth, prosperity and peace”. From the Kibbutz return to Route 35 and proceed a short distance east for a stop at the marker with the Egyptian flags. This site memorializes that country’s unknown soldiers who died during Israel’s War of Independence. Our Israel trip will now continue with a visit to the Joe Alon Center and its Museum of Bedouin Culture. Proceed on Route 35 to Route 40 and then turn right. At the Lehavim junction turn left onto Route 31 toward the Lahav forest in the distance. Turn left through a forest of towering evergreens, following the sign to the Joe Alon Center. Your drive has taken you through the north-eastern Negev through an area where the flora and fauna of the coastal plain, the lowlands know as the Shephelah, and the desert meet to create a unique environment. The area is dotted with caves, archaeological sites and Bedouin communities. The Joe Alon Center was built in the midst of the Lahav forest, which was first planted by the KKL/JNF in 1952 and covers almost 7500 acres. Today, approximately 160,000 Bedouin live in the Negev, while another 70,000 reside in the Galilee. About one half of these are descendants of tribal migrations from the Arabian Desert from as early as the seventh century C.E. Though originally pastoral nomads, many of the tribes have settled permanently into well-established towns such as Lakiya, while others reside in communities of corrugated metal homes, or live with their extended families in large tents where they are sustained by their camels, goats and sheep. Many of these roadside communities have been erected without the permission of the Israeli government, and continue to lack basic services such as sewage or electrical systems as well as health care and educational facilities. Though the essential elements of Bedouin life in terms of family, tribal loyalty and hospitality, are steadfastly maintained, the transition from a traditional semi-nomadic existence to a more modern lifestyle is creating tension in the community as century’s old way of life is disappearing. In recognition thereof, a concerted effort has been undertaken to preserve the material culture of the Negev and Sinai Bedouin. 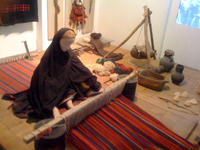 Anthropologists, historians and other professionals have successfully documented a soon disappearing lifestyle and have collected at the Joe Alon Museum of Bedouin Culture an array of ethnographic material of significant educational value. You can easily spend an hour strolling among the colorful displays learning about the traditional ways of the Bedouin, the significance of the women’s clothing and jewelry, women’s roles in tending the flock and processing wool, migration routes and the constant search for water, as well as the role of the men in farming, fishing and hunting. The history of the Bedouin and their traditional customs are artfully explained by large photographs, scale models, and other artifacts supplemented by replicas of Bedouin tents, tombs, artwork, embroidery and handicrafts. Audiovisual presentations are available in a number of languages and often an authentic Bedouin tent is manned, complete with cooking and weaving demonstrations. The Joe Alon Center memorializes a man whose connection with the Negev is legendary. Born Joe Paczek in Kibbutz Bet Alpha, of parents who would later perish in the Holocaust, Joe Alon became one of Israel’s premier fighter pilots. After receiving his flight training in Czechoslovakia on airplanes that would soon find their way to the Jewish forces in Palestine, he advanced quickly through the ranks of the nascent Israeli Air Force. Joe became a driving spirit in the establishment of the Hatzerim air force base in the Negev and soon thereafter ascended to the position of its commander. In 1970, Joe was appointed Air Attache’ at the Israeli Embassy in Washington D.C., but shortly before the end of his assignment was found murdered in front of his home. The perpetrators of Joe Alon’s murder have never been found. But today, Joe Alon’s love of the desert and its people is duly commemorated by the center that bears his name. Visiting hours at the center are on Saturday through Thursday 9 to 5 (4 p.m. in winter). On Friday the center closes at 2 p.m. The center can be contacted at 08-991-03322 or 08-9918597. It’s been a long day of sightseeing, and you may now wish to end your Israel tour and return to your home base in Tel-Aviv or Jerusalem, or overnight in Beersheva. The Leonardo Hotel, formerly the Golden Tulip, which is well situated in the city center, may be a good choice for you. Follow Route 40 or 60 into Beersheva and look for #4 Henrietta Szold St. You can make reservations by calling 08-640-5444. To further obtain a perspective on the life of the Negev Bedouin a short drive the following morning to the desert weaving center in the town of Lakiya would be of interest. 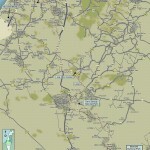 From Beersheva, follow Route 60 to Route 31 and turn left for several kilometers. Turn left at the sign and after the second traffic circle, park near the green building on the right. As you enter the colorful showroom/work area, you may be greeted by Hala, the Director of Marketing of the Lakiya weaving initiative. Hala is a university graduate whose English is impeccable. When she’s not guiding a tour, she can be found on the phone or at her computer managing the initiative’s work flow or the efforts of her marketing agents. 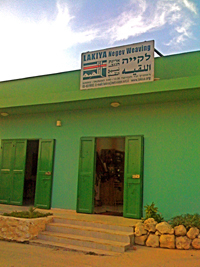 The Lakiya desert weaving project was begun in 1991 in an effort to provide employment and socialization opportunities to Bedouin women who had been relocated with their families to Negev towns or to those still residing in villages. The project is operated by “Sidreah,” a non-for-profit organization whose goal is to empower local Bedouin women by channeling traditional skills into profitable cottage industries. Today, Sidreh provides looms to approximately 70 women who work either individually or in small groups in their homes. These women receive balls of yarn ready for weaving and dying from local shepherdesses who spin fleece into yarn while tending their flocks. By using ground looms identical to those used by Bedouin women for the last 4,000 years, traditional crafts have been revitalized, while providing Bedouin women with the opportunity to earn an income as part of an expanding modern business venture. 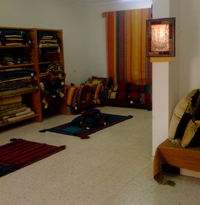 Hala is pleased to take her visitors to the rear of the showroom where traditionally garbed Bedouin women demonstrate skeining, the use of the loom, and the dyeing and sun drying processes. Many of the geometric forms are traditional Bedouin patterns, as are the vivid greens, blues, rust and black colors that make up the rugs, wall hangings, cushions and bags that are for sale in the showroom. The showroom hours are Sunday through Thursday, 9 -5 and Saturday 10 to 4. You may wish to schedule your visit by calling 08-6519883 or 050-5210327. We will now continue our Israel tour of the Negev with a visit to Tel Beersheva and then the beautifully preserved Nabattean/Byzantine site of Mamshit. Immediately past the community of Omer on Route 60, you will note the sign to Tel-Sheva. Follow this road past the community to the entrance of the Tel Beersheva National Park. In 2005 the tel was accorded accreditation by UNESCO as a World Heritage Site for its outstanding representation as a city from the time of the Bible and is an important stop for those participating in holyland travel. Though the foundation walls of many administrative structures and private dwellings have been excavated and can be explored, I have found the site most notable for the preservation of its unique water system, especially its immense subterranean water reservoir. 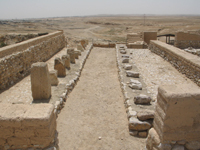 Finding water was foremost on the minds of Tel Beersheva’s first inhabitants as evidenced by the fact that the settlement was established on the northern bank of a stream-bed in a wide arid valley. Such stream-beds served a dual purpose as a functional thoroughfare through the desert as well as possessing a lower water table enabling these early settlers to have easy access to water via wells. The national park beautifully preserves one of these early wells which was hewn outside the entrance walls to the city. As such it would have served the needs of not only the city’s early inhabitants, but also the requirements of the caravans that passed by. Archaeologists from Tel-Aviv University who excavated the site from 1969 to 1976 suspect that this deep well may be a remnant of the Iron Age people that dwelled on the mound at the end of the second millennium B.C.E., an era known as the Israelite period. For this reason, some biblical scholars like to connect this well with the narrative in Genesis which has Abraham presenting to Abimelech seven sheep as proof of the well that he had dug and the oath (shvuah in Hebrew) that they together had taken to seal a treaty. The entrance to the city is via the outer gate which is adjacent to the well. As you follow the path to the excavated main gate, note the paving stones covering the route. Underneath lies a drainage channel which was part of the town’s complex water system, which had permitted water not utilized by the inhabitants in their daily needs, to be funneled to the large water reservoir. Further down the path you will encounter the remains of the “Governor’s Palace,” which in its time had splendid ceremonial and residential areas. Nearby, in the residential quarter, archaeologists have retained the 8th century B.C.E. level where the city’s new fortification system created a parallel double wall surrounding the mount, known as a “casement wall,” which also served as the back wall of the residences. After a short walk down the trail, visitors can explore the interesting remains of the storehouses with their wide paths that had permitted pack animals to easily maneuver their loads. Today, you can well imagine supplies being unloaded and placed into the series of store rooms aligning the three long hallways. 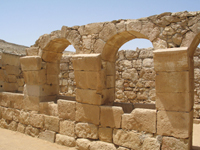 Archaeologists suggest that these storerooms are indicative of the town having served as the main administrative center of the northern Negev prior to its destruction in the late 8th century B.C.E. During their field work they were also astounded to discover the dismantled stones of a four-horned alter embedded in the walls of one of the storerooms. This sacrificial alter has been reassembled and is on display at the Israel Museum, which is also a must-see on your Israel trip. A replica can be found near the entrance gate of the national park. 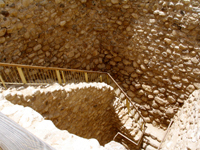 Now retrace your steps to the observation tower from which you can enjoy the desert landscape, the views toward the high-rises of Beersheva, but most interestingly, the layout of the tel immediately below you. From there its a short walk to the water reservoir, which was established within the walls of the city to ensure its residents a continuous supply of water in times of siege. The 17 meter deep stone-lined shaft leading to the immense water reservoir below ground is a magnificent representation of the ingenuity of Tel Beersheva’s early inhabitants. As you carefully descend the steps, note the thousands of stones that were used to line the face of the shaft. However, only upon entering the 700 cubic meter cistern can you fully appreciate the labor that was involved in carving the five chambers of the reservoir from it’s chalk rock, hoisting the material to the surface and then plastering the walls to prevent water seepage. Near the exit is the feeder channel that permitted flood water to enter the reservoir, while above ground are the remains of a stone-built channel that funneled this water from the Hebron stream to the feeder channel. As useful as the water reservoir may have been to the residents of Tel Beersheva in previous battles, the town succumbed to the forces of the Assyrian King Sennacherib at the end of the 8th century B.C.E. The town lay in ruins until the Persian period when a small fortress was constructed on the mound. Though the Greeks and Romans later utilized the site, Tel Beersheva never again regained it’s stature as an important administrative center with an enterprising and imaginative population. As you exit the tel, retrace your way to Route 60, where you will turn left. Follow the signs 60/40 for a short distance and then turn right into Route 40. Immediately on the right on a hill you will note several concrete geometric formations, the Palmach’s Negev Brigade memorial. The Negev Brigade was formed in April 1948 with two military objectives in mind. The first was to secure the road to the north, toward Tel-Aviv, and the second was to assist in defending the crucial water pipelines in the Negev. Sculptor Danny Caravan has captured the essence of the brigade’s mandate by erecting forms resembling a damaged water tower, a Palmach tent, a look-out post inside a trench, a water supply line, a bunker, and a serpent shaped building representing the retreating Egyptian army. 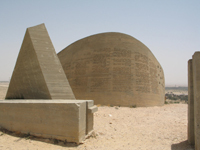 Prose, poetry and excerpts from the Palmach Brigade diary are etched onto the concrete forms, and in the memorial dome the names of fallen soldiers are inscribed. The view from the hill toward modern Beersheva reminds the visitor of the Palmach Brigade’s other success during the War of Independence, capturing the old city of Beersheva. Our journey through the Northern Negev continues with a visit to another UNESCO World Heritage site, Mamashit National Park, which today beautifully highlights the culture of the Nabateans, a people that built important cities along the 1,400 mile desert trade route in what is now Saudi Arabia, Jordan and the Negev. You may be most familiar with the red sandstone facades at Petra, an outstanding example of Nabatean architecture. Mamshit was built at the end of the first century C.E. to link Petra with the port in Gaza to facilitate the transport of spices, frankincense, myrrh, balsam and other goods from the Orient to Europe. The Nabateans also harvested asphalt from the Dead Sea and sold it to the Egyptians for their embalming and mummification processes. 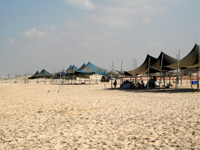 The site is one of the most important desert attractions in Israel. The hot arid climate has well preserved the artfully constructed homes of wealthy Nabatean traders and horse breeders. The notable Arabian stallion was bred at Mamshit, and in fact, the stable and a large stone trough have been excavated. The site today retains its wide streets and homes adorned with beautifully chiseled arches, large terraces, pools, baths and frescoes. As was typical of trade route cities, Mamshit too was built near an oasis which provided sustenance to desert travelers and residents alike. During the Hellenistic period Mamshit prospered and became known as Memphis. Subsequently under Roman rule of Palestine, Mamshit was incorporated into the empire and became a walled garrison, as evidenced by the Latin inscribed tombstones of soldiers found nearby. In the Byzantine period, when the trade in spice through the southern desert had run its course, the residents used the nearby stream, dams and cisterns to cultivate agriculture. It was also then that the two churches found within the walls of the city were erected. 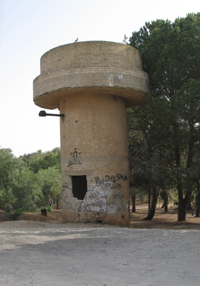 Mamshit can be reached by exiting left from the Negev Brigade Memorial and proceeding on Route 40, in the direction of Dimona. Then turn left into Route 25, driving past Dimona. Turn right at the directional sign to Mamshit and follow the paved road for about a kilometer to the entrance of the national park. As you enter the walled city through its late Roman-era front gate note the wagon wheel groves on the stones below. Your first stop will be the “House of the Affluent” with it’s large courtyard, adjoining rooms and nearby the stairs leading to the tower. Here, you will find the first examples of the artistry of Mamshit’s master stone masons in the form of arches, plinths and capitals. From there it’s a short walk to one of two churches constructed during the Byzantine period when the residents of Mamshit converted to Christianity. The Western or Nilos church, so named in a Greek floor inscription for its benefactor, has in its nave representations of typical Byzantine mosaic motifs of peacocks, birds and geometric forms. 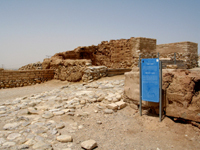 Nearby is a Nabatean house with a stable large enough to have accomodated sixteen horses. The height of its walls, beautifully chiseled stone troughs and arches are a noteworthy example of the wealth of Mamshit’s horse breeders. At the other end of the city, the Eastern church, “Church of the Martyrs”, was constructed as part of a larger monastery complex and retains its well preserved atrium, narthex and nave. As with the Nilos church, here the apse is at the east permitting worshipers to face Jerusalem. In the rooms adjoining the apse, archaeologists discovered cabinets which they believe would have stored the bones of saints. You can now walk along the former market street with with its parallel rooms, to the “Nabato House.” Though this large complex also has a stable, its mythological Greek frescoes are particularly impressive. 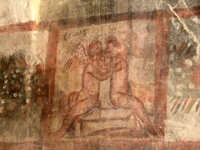 One colorful panel represents the gods Cupid and Psyche sitting on a low bench and kissing. See if you can also find on some of the capitals the decorative carvings of a bull’s head and a figure of a man. As you walk through the city, note the large cisterns within the courtyards, water channels and stone drains coming down from roofs. These, together with the three large dams constructed along the stream, are representative of the sophisticated water management techniques developed by the Nabateans at Mamshit. Next to the pool, archaeologists discovered a Byzantine bathhouse whose ceramic pipes that carried heated air to the calderium are still clearly visible today. As you prepare to depart Mamshit, you may wish to retrace your way to the path outside of the walls leading to one of the dams that has survived since antiquity with some repairs by the British during their Mandate of Palestine. As you proceed from the national park to the main road note on the right the Mamshit camel farm which provides a taste of Bedouin hospitality. The experience of eating a hearty meal of various meats, chicken, vegetables, salads and pita, before retiring to your sleeping bag in a large Bedouin tent, is tailored to groups of four or more. An early morning camel ride may await your group as well. You can make reservations by calling:08-6552829. This concludes our two day adventure tour of the northern Negev. From Mamshit you can make your way to the Dead Sea, and from there to Jerusalem. Alternatively, you can follow route 40 until it intersects with Route 6 which will speedily return you to Tel-Aviv and Jerusalem.